Two Congressional Republicans on Thursday introduced a proposal to implement federal paid leave for new parents. 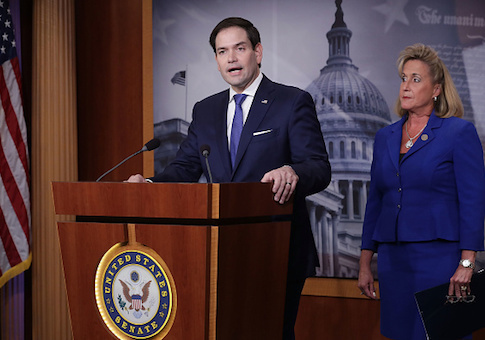 The proposal, to be introduced as the "Economic Security for New Parents Act," is the work of Sen. Marco Rubio (R., Fla.) and Rep. Ann Wagner (R., Mo.). It would work by allowing parents to draw on Social Security, taking funds from their future entitlement to pay for some number of weeks off, and in return retiring the same number of weeks later than they would have otherwise. Americans are already entitled to up to three months of unpaid family leave, under the Family Medical Leave Act of 1993. But, according to the Pew Research Center, America is the only nation out of 41 advanced countries not to have mandatory paid family leave of some sort. California, Rhode Island, and New Jersey all offer PFL at the state level. As America continues its baby bust, with fertility below replacement continuously since the mid-2000s, the cost of having kids weighs heavily on the minds of would-be parents. A recent poll published by the New York Times found that the cost of child care is the number one reason why Americans expect to have fewer kids than they would otherwise. Still, opponents of federal PFL have long-argued that it would be prohibitively expensive to either employers—who would be compelled to pay their employees without labor in return—or to the federal government, which would have to shoulder some or all of the wage-replacement burden. The great appeal of Rubio and Wagner's plan is that it would not increase current total government liabilities, because it would pay parents from a pot of money they are already entitled to access. "This plan does not grow government," Rubio said Thursday. "We're not creating a new entitlement, we're not creating a new program. We're simply creating an option that allows people to use part of an existing program earlier." Estimates from Rubio's office show that individual parents would be entitled to a fixed percentage of their income, up to 70 percent, as a bimonthly payment over the amount of leave an individual wants to take. The percentage to which they are entitled declines as their annual income declines, and makes up less of a percentage of income as the amount of time they take increases; couples are allowed to draw on their Social Security individually, however. What this means, for example, is that in a household of two parents earning $40,000 each per year, Social Security would pay for 77 percent of income replacement for each individual. Further, under the law one parent could transfer his benefits to the other while still working, thus permitting Social Security to pay more than 100 percent of the second parent's income. The plan has the benefit of having a minimal present economic impact—as Rubio noted in his remarks, it does not impose new mandates on business or introduce new taxes or spending programs. Still, there is some reason to be concerned about a large group of people drawing on Social Security in the present. Allowing new parents to spend their Social Security entitlements now would add them to the already-large—61 million as of 2017—pool of active beneficiaries. Rubio contended in his remarks that the proposal "doesn't threaten the future of Social Security," it's hard to see how adding more consumers without also increasing the number of workers in the economy wouldn't hasten the program's nearing insolvency. PFL has had at least one noteworthy ally in the White House: Presidential adviser and daughter Ivanka Trump. She and Rubio took advantage of President Donald Trump's mention of the idea in his State of the Union to begin the discussion which ultimately bore the new bill. Speaking to Axios on Thursday, the younger Trump noted that her father "has called for maternity and paternity and adoptive leave and we're working to make that happen." She however does not, Axios reported, expect to see much progress on the proposal this congressional session, citing partisan gridlock standing in the way of what she sees as an ultimately bipartisan issue.